A lot of guys are good in secret admiration and it's not a bad sense of act, but what makes it worse is when you are secretly admiring a lady and you are busy telling people about the lady and how you feel about her, but the moment she is right there in front of you, you won't be able to say a word that is related to how you feel about her, instead, you will be busy discussing something else like, how her studies or work is going. 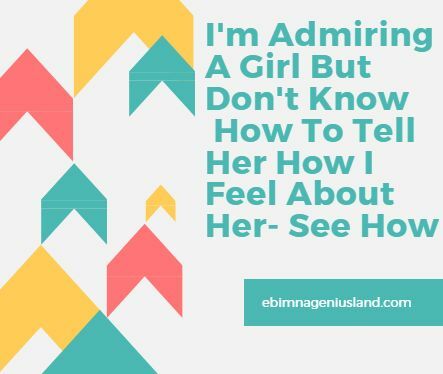 All you need to do when you are secretly admiring a girl is just to mellow down think along with us by continually reading this post today, in a way that it will add so many benefits to your life when the time is due. I use to have a feeling for a guy but I don't know how to walk up to a guy and tell him how I feel, although I have in so many ways and times have seen him with his best friend. I don't even know what to tell him because I'm a lady trying to propose to a man, how great is that? Men are busy dying in silence when there is someone they are feeling for there outside the world, all the need to to do is to make a final decision and take the right steps. Having a sound mind is simply one of the best things you could do if you must approach a lady you are secretly admiring. When you have a sound mind, you will be able to think about the words you are about to say to her before uttering them. As a man, you are expected to be very brave and bold in all angles, don't ever think of wooing a girl when all you have for her is just affection and loss. Moreover, after you have discovered that there is no boldness in you, all you have to do is to walk on your self as a man. Pray for a sound mind and bold spirit to achieve what you want in life, as long as you are seriously positive with the things you want in life, you must have to go for it, without having a biased mind. When you have something to say to a woman or to anyone you love, just be free and say it out, stop thinking about how they will fall when you say those things, you will always have to say it first, just to please yourself first, because hen you please yourself first, then you will be free minded, to be able to listen to how others feel. Being straightforward to a woman you are admiring is good, but sometimes there are some things that are meant to be said to make the arena conducive and ready for the word you are about to hear, then, you will be able to say the things you wanna say. It's all about being wise and being honest with your lover. When your words are true and honest, they will be really understandable in the hearings of the person you are uttering the words to. Advice: Guys stop pretending when you admire a girl, go straight to her and tell her what you feel and how you feel whenever you are around her. Stop being ashamed of your stature or how ugly you are looking. Always remember that you are just the way you are created, for the fact that you are poor doesn't mean that you will remain poor forever, and for the fact that you are not tall doesn't mean that you are not taller than some other dwarfs outside the world.